If you’re in Florence for the holidays and want to know what is going on during this time aside from the Christmas markets all over Florence and Tuscany, here are some useful ideas that will help you better plan your days. First, if you or your children would love to spend some fun time outdoors during this time, head to the ice skating rink at the “Parterre” in Piazza della Libertà which will be open everyday up until January 9. In preparation for Christmas, Santa Claus or “Babbo Natale” as he is called in Italy has this tradition in Florence: he arrives by boat!! On the 23rd of December, “Babbo Natale on the Arno” conveys Christmas wishes to locals as well as tourists watching along the banks from his boat as he sails along the Arno. Plan to be along the river around 2.00 p.m. to see him as he passes between Ponte Vecchio and Ponte alle Grazie. The Ephiphany marks the end of the holiday season. In Florence, the arrival of the Three Kings is celebrated by the traditional “Cavalcata dei Magi” (Ride of the Magi) which is a sumptuous procession in sixteenth-century costume that crosses the entire historical center, starting in Piazza Pitti and arriving to the Duomo. The magi deliver their gifts to baby Jesus, part of the living crèche (nativity scene) set up that morning in the Duomo. The procession starts at 2.30 p.m. from Piazza Pitti. If you happen to be in Florence on January 6, do not miss this spectacular event! 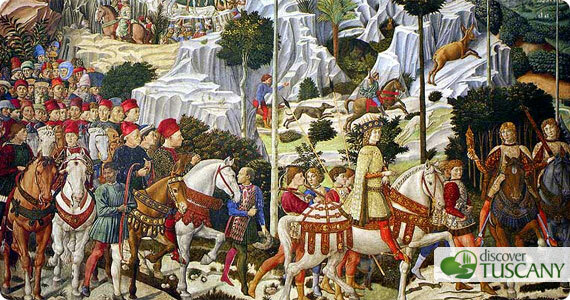 If you have not seen the frescoes of the Chapel of the Magi by Benozzo Gozzoli in the Palazzo Medici Riccardi, the chapel will be open and guided tours will be organized for the occasion.